I’m on the road but still delivering reviews. Matt Leacock took the disease curing fun of Pandemic and condensed it into a fast paced dice game. I’m sold, but let’s give Pandemic: The Cure a closer look because who knows which of these two games is better or if you should pick up both. 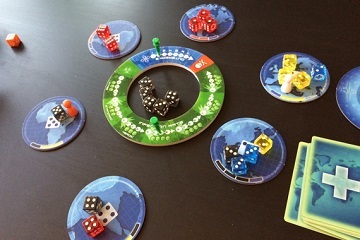 You set up the game with the pandemic track (the ring-shaped, plastic piece) in the middle and six coasters—representing different areas of the world—around it. Area 1 is North America, Area 2 is Europe, and so forth. Pandemic: The Cure has four colored dice (red, blue, yellow, and black) that resemble ordinary six-sided dice, but don’t let them fool you. These dice represent the different diseases you must cure, and they aren’t numbered one through six. Whatever number you roll corresponds to the numbered coaster (one of the six areas). For example, South America is Area 6, and you can roll a six with either a blue or red die. No, I didn’t look at the individual dice, the ratio of what you can roll on a die is located by a grid on the bottom of each area coaster. So, you begin the game with thirteen disease dice in play. The pandemic track is interesting because you’re keeping score of not only the outbreaks (whenever you would place more than three dice of a color on a coaster) that occur but also the infection rate (you can roll an infection on a player die—more on that later). You track the disease’s progress with green syringe-shaped pegs and every time you trigger an event that creates an outbreak or would increase the infection rate, the pegs move closer to a red space, marked with a skull and crossbones. If either track reaches the skull, you lose. 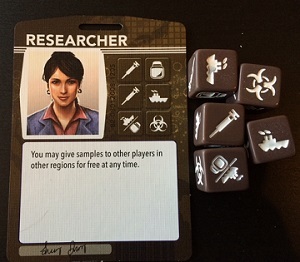 Players select their role—either at random or by some other means—and each of these roles has its own ability (listed on the card) and its own set of dice. 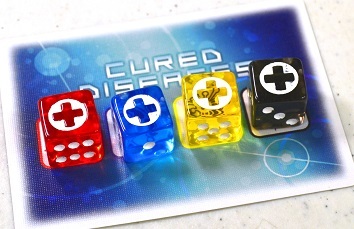 Player dice have various abilities, but most have die faces that allow you to move, treat diseases (removing dice from coasters), bottle cultures so you can find a cure, or increase the infection rate. Players work together to cure all four diseases and if they do so before either green peg reaches the skull, they win. The phrases “Extra Strength Dice Game” and “Fast-Acting” grace the game box, but these are more than just tongue-in-cheek references to medication. Pandemic: The Cure does convert all the strategic fun and disease fighting of the original and puts it into a quick dice game. The randomness of dice rolling prevents the puzzle like quality of the original from showing. 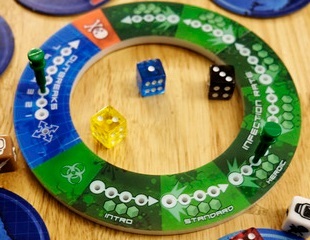 Some Pandemic showed how they’d play out in five or six turns and it was only a matter of the players adjusting to the puzzle and solving it. That doesn’t exist in Pandemic: The Cure. 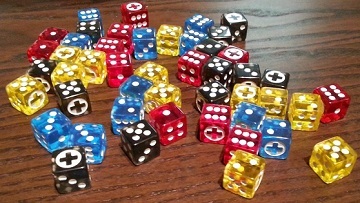 The unpredictability of the dice and smaller regions can cause the game to flip on its ear in a single turn. These diseases are stronger but so is the cure. Okay, that was a bad cure pun, but players do feeling both more in control (because of the improved strength of their roles) and less in control because things can turn bad in a hurry. I love this game as much as the original. Matt Leacock did a great job capturing the idea of Pandemic in a dice game.